The wait is over! Finally our exclusive interview with rookie girl group PinkFantasy is here! Pink Fantasy is an 8-member girl group consisting of Aini, SeeA, Heesun, Yechan, Arang, Yubin, Harin, and Daewang. They are under My Doll Entertainment who debuted on October 24th with 'Iriwa'. Check out their interview below. Pink Fantasy: Hello everyone! We are Pink Fantasy. Our members have various ages, from the youngest Heesun born in 2005 to Aini born in 1991. Q. First of all congratulations for your debut with 'Iriwa', how do you feel worked with Super Junior's Shindong for this debut track? Pink Fantasy: Shindong is a member of Super Junior, the mainstream of Korean wave. It was an honor to worked with him and we were very grateful. Q. What was your favorite or memorable moments while filming 'Iriwa' music video? Pink Fantasy: During the music video shooting, huge lighting equipment fallen on to studio also drone camera could not found their signal so crushed on to the ground, these accidents might be good signs to our future career. Pink Fantasy: It was fun and interesting. Nobody expected fans' support. This is very grateful now. I think we should do much more best for them. Q. What did you think about Pink Fantasy's concept? Pink Fantasy: All members thought the concept are Creepy & Cute. Also, we love the concept. Q. So many fans asked this, please tell us more about Daewang, can we see her face someday? Pink Fantasy: Daewang is the king of rabbit and you saw its face already. Q. Do you guys have special / hidden talents? Pink Fantasy: Pink Fantasy's 'Iriwa' dance cover (puhaha) .. and idol dance videos ! Q. Who is your model? Is she/he inspired you to become an Idols? Pink Fantasy: Morning Musume from Japan ! We want to be an idol that gives a family-like atmosphere and happiness. Q. Which country you want to visit the most? and why? Daewang : Spain, seems like we have fans the most there! Seea : A warm country, I like the sunshine. Yeachan : America, I want to go to the biggest Disneyland. Yubin : England, the streets are beautiful. Harin : Venice Italy - I would like to board a water taxi. Arang : Hong Kong, I want to see the night view from Victoria Peak. Q. What other animal would you be if you're not bunnies? Q. What concept would you like to try for next comeback? or any specific genre of music that you want to try? Pink Fantasy: We want to have different concepts every time. We don't have specific genre for this time. We will show you soon as surprise! Q. If you had to eat just one food for the rest of your life, what would it be? Q. What is your current favorite song or song you listened the most these days? Pink Fantasy: The youngest Heesun is the mood maker! Q. To all members, which variety show you want to appear on? Running Man, Knowing Brothers or other? Pink Fantasy: If there is a chance to appear!!!!! We want to go everywhere. Q. PinkFantasy's biggest goal as a rookie group? Q. To all members, do you have any ideas for a fandom name? Pink Fantasy: We are having a name event at the fan café. We are expecting great name from the fan. Pink Fantasy: Thank you. We love you guys so much. Please stay with us for a long time. That was our interview with Pink Fantasy. 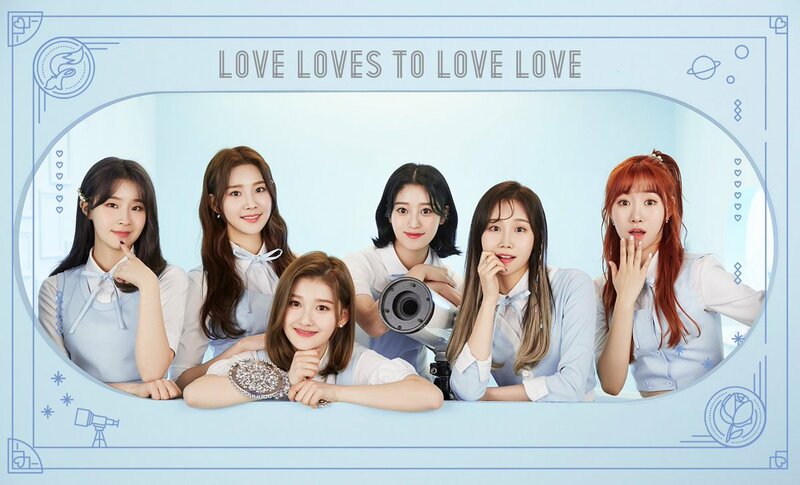 Thank you for everyone who sent questions for the girls! We're back again with another exclusive interview! This time we had a chance to meet rookie girl group NeonPunch who made their debut in June with first single 'Moonlight'. NeonPunch is the first girl group from A100 Entertainment consisting of 5 member Da Yeon, Terry, Baek Ah, May and Iaan. 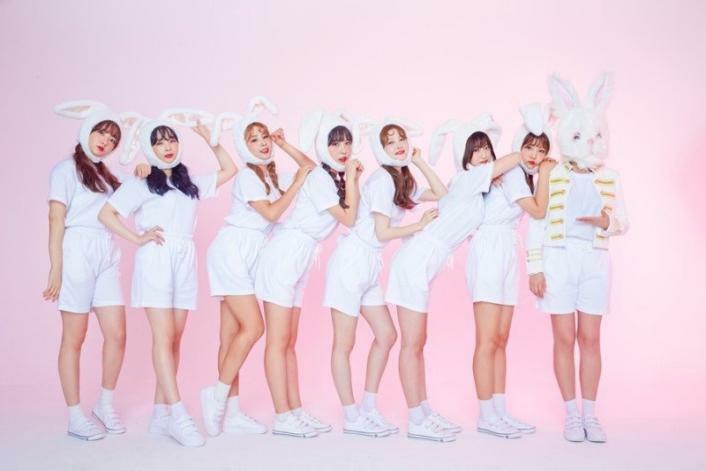 Let's getting know more about them by checking NeonPunch's exclusive interview with Girl Group Zone below! Q. First of all, congratulations for your debut! How do you feel about it? NeonPunch: We are so glad to have our fans all over the world. It was an amazing experience to us. Love every all of them and feel responsible for them. Q. Any dificulties while preparing your debut? Q. What was your reaction after heard the title track 'Moonlight' for the first time? Do you like it? 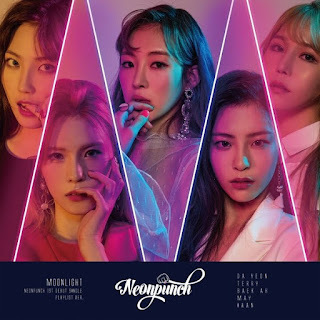 NeonPunch: At first, we were not quite sure about our title song 'Moonlight' but it's an very addictive song. Q. Despite being a new group, NeonPunch are promoting in Korea, China and Japan, how do you feel about it? DA YEON - I was really thankful because it's not easy to promote in other countries. TERRY - I think it was quite an important part of the promoting to let others know about us. BAEK AH - I was so glad to have overseas fans by promoting in other countries, and also I was really excited because it was my first time going abroad. MAY - It was my first time going abroad, so I was a little bit nervous but fun too. I would like to promote more in other countries as well. IAAN - I was really thankful to succesfully debut in other countries and I hope we become more famous all around the world. Q. Which country do you want to visit the most? and why? DA YEON - I love every country. But I want to go to Japan again. Japan has so many delicious food. TERRY - I've lived in Japan before, so I like Japan the most. But also want to go to LA if I have any chances. BAEK AH - Australia. In the past, Australian friend lived with my family for few years, so if I go to Australia, I feel like she will taking good care of NeonPunch members and make us have a fun time there. MAY - Japan! Because so many people around me told me that Japan is so good. IAAN - America. America became my dream country after I read a book about America when I was young. Q. if you had to swap positions with any other member, who would you swap with? or do you want to try another member's line in 'Moonlight'? DA YEON - Iaan! Because I'm the oldest of our member, so I wonder how Iaan lives as the youngest member. TERRY - Baek Ah! Because she has taken the only twist point part. But that part fits perfectly on her. BAEK AH - Terry! Because I think her part is the killing part of our song just before the climax. MAY - Da yeon. Because I like her singing part. It sounds so good to me. IAAN - May! Her first part on 'Moonlight' sounds so good and also the choreography is pretty. Q. Who takes longer time to learn the choreo and who learns faster? DA YEON - I think Iaan is the fastest and others are quite similar including me. TERRY - I think Baek Ah and Da yeon learns fast and Iaan takes longer time but she's the most meticulous. That's why Iaan has the title 'Dancing Machine'! BAEK AH - I think Terry is the fastest. MAY - I think I'm the slowest. I should practice more. Others do all well. IAAN - Baek Ah is the fastest I think. Q. If you had to eat one food for the rest of your life, what would it be? DA YEON - That's a tough question. I will just choose what I want to eat it now. It's pork belly. TERRY - I will choose rice cake. It's the only carbohydrate that I eat. BAEK AH - Beans! Because I love beans. My mom used to steam only beans in rice cooker. I will marry beans. MAY - Bibimbap(korean food)! It has various materials in it so maybe I can eat it forever. IAAN - Spicy stir-fried pork with rice (korean food). NeonPunch: When we did photoshoot individually, it was the most memorable moment. Every space was so pretty. Q. What song you listen the most these days? or any song you'd like to recommend to your fans? Q. What concept you'd like to try next? DA YEON - I want something black. Something that has charisma. TERRY - Something dark but an attractive concept. BAEK AH - Dark concept with suit or wearing hanbok (Korean traditional clothes). MAY - Dark concept with nice mood. IAAN - Dark strong concept. Q. Who is your role model? is she/he inspired you to become an idol? DA YEON - I can't just choose one but if I have to, I will choose 'IU'. She is so talented with everything. I want to be like her. TERRY - SNSD's Taeyeon! She was the most influential person when I've learned how to sing for the first time. BAEK AH - Lee Hyo Ri. She is good at everything, and I love her charisma. MAY - Sunmi. I love her expression and natural gesture on the stage. I respect her and wanna be like her. IAAN - HyunA. I think she is a very talented person and so attractive. DA YEON - Running Man, Knowing Brothers. TERRY - Running Man, Knowing Brothers. BAEK AH - Running Man, Law of the Jungle. MAY - Knowing Brothers. So my style. Q. NeonPunch's biggest goal this year? NeonPunch: Becoming more famous all over the world. Being loved by our fans. Q. if you were stranded on an island and you could only bring one member, who would it be? TERRY - May! It's so fun when I'm with her. I won't get bored. BAEK AH - May. I think it will be fun when I'm with her. MAY - Baek ah! Because she always takes good care of me. IAAN - Da yeon. Because she is the leader of NeonPunch. Q. Any group or member of the group that you are close or want to close with? DA YEON - Not yet. TERRY - GFRIEND's Yuju. We are friends since childhood. BAEK AH - ELRIS' Hyeseong and Bella, H.U.B's Rui, also Cocosori's Sori. We are friends. I wanna contact them everyday if I have a cellphone. MAY - Girls' Alert's Saetbyeol. We are students in the same high school. Q. What is your special talent or secret that fans didn't know before? DA YEON - I have a bad memory. TERRY - I'm good at petty tricks and I don't like games. BAEK AH - I don't like shopping. I like tearing paper. I have no interest in fragrance and good at reading lyrics like a poem. MAY - I know 3 secs before my stomach rumbles. IAAN - I'm good at push-up. Q. What hair color that you want to try in the future? DA YEON - Black. I've never done it before. MAY - Blonde with bobbed hair. NeonPunch: We love you so much, miss you so much, wanna see you so much! Please remember us and love us more. We will do our best so you guys won't be disappointed. That was our interview with NeonPunch, hope you guys enjoy it and stay tuned for more interview. Thank you! Find out TWICE's Mina, Dahyun, Nayeon, Chaeyoung and Momo's charms!